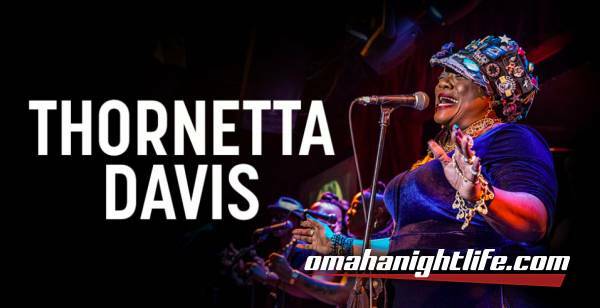 Experience the soulful sounds of "Detroit's Queen of the Blues," Thornetta Davis! A respected singer and talented songwriter, Davis possesses a strong voice, melodic command and smooth delivery that have been exciting and wowing audiences around the world for over 30 years. Backed by a great band of veteran Detroit musicians, she tells her stories with incredible delivery, always leaving her audiences wanting more. Having shared the stage with legendary blues and R&B greats such as Ray Charles, Gladys Knight, Smokey Robinson, Etta James, Buddy Guy, Koko Taylor, Junior Wells, Lonnie Brooks, Johnnie Johnson and many more, her history is extensive and performances memorable. Most recently she appeared with Taylor Mac in his historic 24-hour performances of American popular music, in New York, and also in Australia and New Zealand. Other major appearances for television include "Jimmie Kimmel Live" and performances with Bob Seger and the Silver Bullet Band on "The View" and "The David Letterman Show". Davis is a Detroit institution and a cultural ambassador for the blues and the Motor City.